I’ve been playing a lot with Neopixels during the holidays. I made a bracelet, a pendant, and earrings for my wife, and also had a 4m 240 LED strip on display over my window. All of these projects share the same animations, just with slightly different parameters: the bracelet has 30 LEDs, the earrings/pendant have 16, and the strip has 237 (some of the Neopixels didn’t quite make it, sadly). Also timings have to be adapted to the form factor. But still most of the code is naturally sharable, so I made a little library I call NeoPixo which handles all the animations. Wait this is all nice and everything, but how do I get the hardware to use this on? While the bracelet, pendant, and earrings, just cycle through the different programs, the strip is very different. It’s connected to a Raspberry Pi, which can program the Arduino using Ino. Ino is a command-line version of the Arduino-IDE, but much better suited for the Raspberry Pi. I have a tutorial covering Ino here. The christmahanukwanzaa-tree example above used an Arduino Yun for this, I chose a Raspberry Pi instead. Having a Raspberry Pi opens a lot more possibilities. 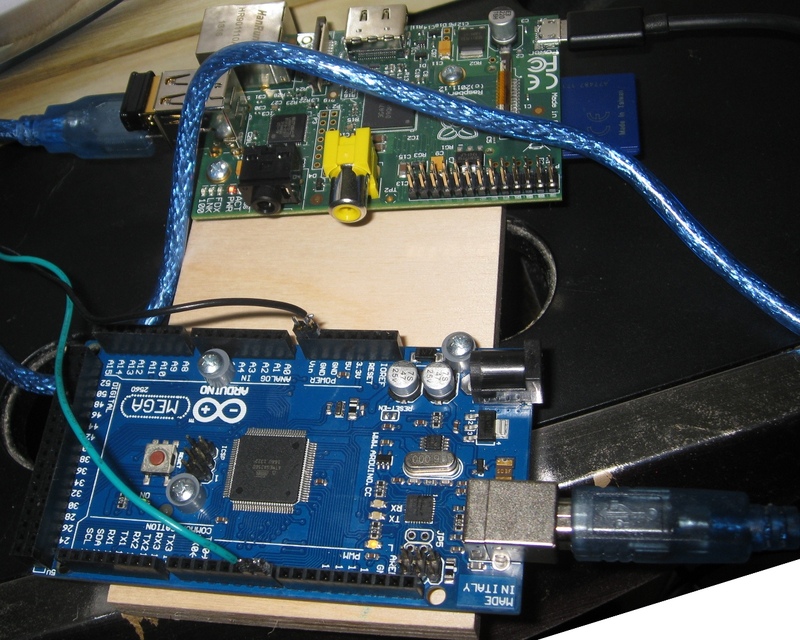 The Arduino can listen for commands on its serial port, and the Pi can schedule the programs now, and also play sounds through an attached speaker. One way is through a web-page, allowing users to click and select the program they want. PHP scripts turn the button clicks into serial port commands, which in turn drive the Arduino. It’s important to grant Apache permission to use the serial port, for things to work properly. To do this run “sudo usermod -a -G dialout www-data” on the Raspberry Pi itself, and then restart Apache. More details on this are available in these pages. Since the Raspberry Pi has an NTP synchronized clock, it’s perfect for a precise countdown until the exact New Year moment. It wakes up 13 seconds before the target time, opens the serial port, and starts sequencing events every second. It also uses to the Raspberry Pi audio out jack to play sounds. I’ve been buying a lot of Adafruit Neopixels lately, and particularly a 4 meter long 240 LED strip which sits next to the Christmas tree. The setup is pretty standard, with an Arduino Mega setting up the various light patterns and movement. But now of course, you want to be able to control and program the Arduino from your network. I’ve seen people use the Arduino Yun for this, and it’s probably the easiest and most elegant solution for this. configure a setup similar to the Yun, where we forward the serial port over the network. This requires a separate host computer where we’d run the Aduino IDE, and compile the sketches. The Raspberry Pi would just be a dumb proxy in this case. install the Arduino IDE on the Raspberry Pi itself, and have it compile and upload sketches directly. This is the solution we’ll be pursuing in the remainder of this article. Running the full Arduino IDE is unbearably slow when you run it on a Raspberry Pi, and through a remote ssh connection. We are trying to do things remotely after all, and the Raspberry Pi is somewhere close to the LEDs, and not very accessible. A command line solution is much better suited here, and fortunately Ino is just such a tool. Well, what are we waiting for, let’s install it! Once you’re done head on to the inotool Quick start guide to compile your first sketch. I have OpenCV code using cvCreateCameraCapture and cvQueryFrame. Can I use it with the Raspberry Pi Camera? Well yes, read on to know how. The Raspberry Pi Camera is widely available now, but there aren’t any open source video4linux (v4l) for it yet. Among other things, this makes it harder to use OpenCV with the camera. When searching for a solution, I found Pierre Raufast’s blog, where he solves this problem. He took the existing userland libraries, which provide the source for the raspistill and raspivid tools. He modified them to produce OpenCV images instead. Excellent news! So I now I can use this in my own OpenCV projects, and bypass the v4l drivers issue entirely. But wait, my code already calls cvCreateCameraCapture, cvQueryFrame in its own main loop, how do I do this? I took Pierre Raufast’s modified camcv_vid0.c file and converted it into a library. Instead of calling cvCreateCameraCapture and cvQueryFrame, you call the new raspi cam equivalents: raspiCamCvCreateCameraCapture and raspiCamCvQueryFrame. Instead of using a CvCapture, you use a RaspiCamCvCapture. It’s a plain and simple search and replace operation in your code. A more detailed README on how to compile and use it is the code repository itself. This is a work in progress, I’ve done limited testing on the library. Contact me if you find bugs. For now, they are hardcoded in RaspiCamCV.c, so you need to change the code, and recompile the library to change resolution, or switch to grayscale mode (which is much faster). After making good progress on my robot arm, it became obvious that to be useful the arm could not remain confined to a table. Instead it had to be mobile. So the next logical step is to build a platform that would be able to move around and eventually have an arm (or maybe even two of them) attached. So I started experimenting with wheels and motors, which led to Hawi: a holonomic drive platform, which instead of using omni-wheels, simply rotates all four wheels completely independently. 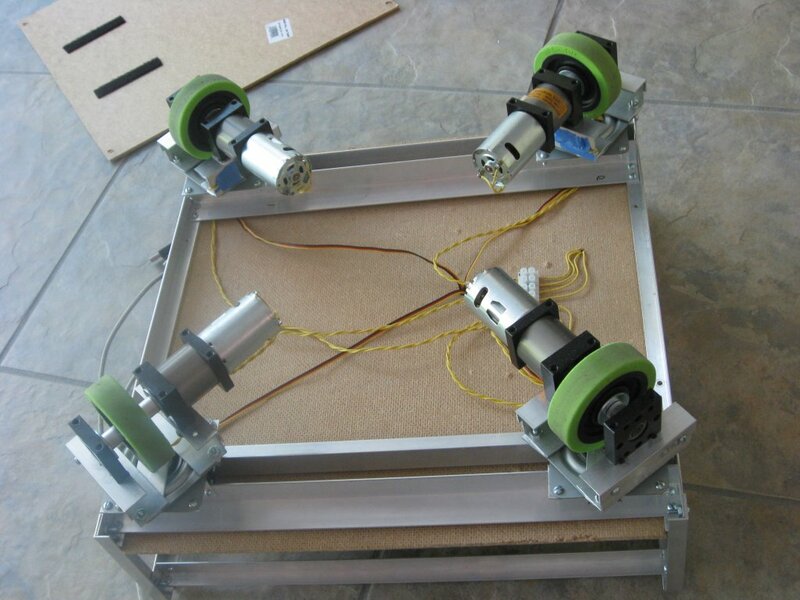 This is achieved by mounting each wheel on a servo. Of course Hawi is a work in progress, I expect to upgrade different parts as needed, just like I did with my robot arm. An Asus Eee PC Netbook is the main brains. It runs the software that commands the microcontrollers and servos. It’s pretty basic for the moment as just uses the keyboard for commands. It’s not very pratical to chase Hawi and type on his keyboard while it’s moving. So I use VNC and control it from another laptop. 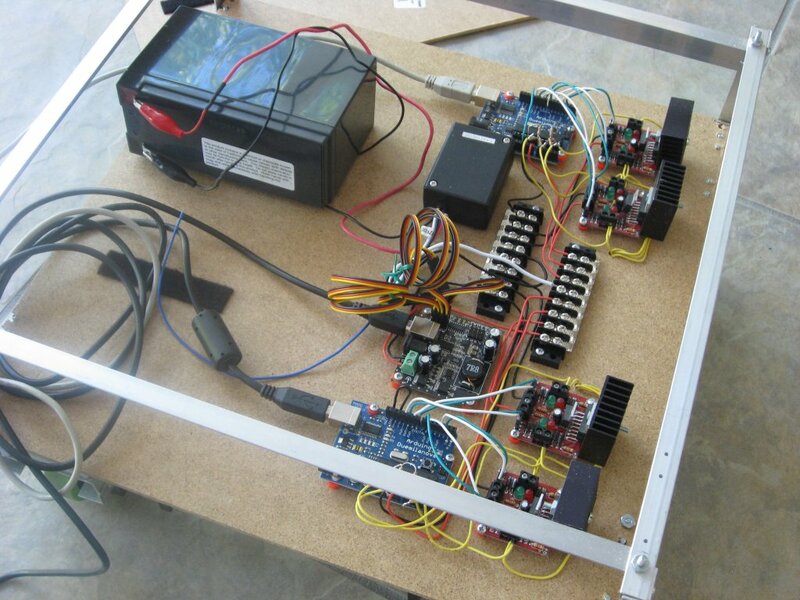 2 Arduino Duemilanove controllers are used to drive the h-bridges and handle back-emf. Each Arduino handles 2 DC-motors. 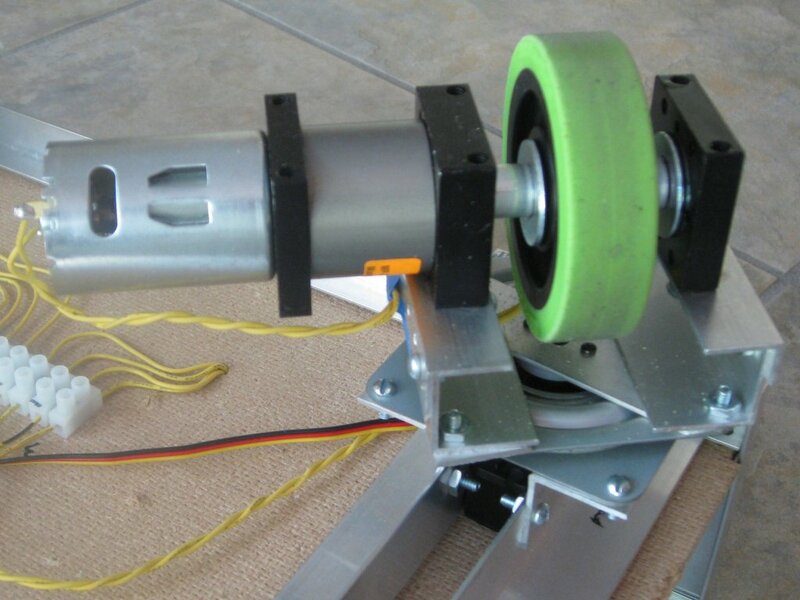 A PhidgetAdvancedServo 8-Motor is used to handle the 4 servos that control wheel direction. 4 L298 H-bridges from Solarbotics: one per DC-motor. Although each L298 can handle 2 DC-motors, the way I wired back-emf only allows me to control a single DC-motor, as explained here. Power is provided by a 12V sealed lead-acid battery. The wheels are mounted to the chassis through a 3″ lazy susan, and you can almost see the HS-322HD servo under the wheel. Mechanically Hawi can handle pretty heavy weights. The wheels are mounted to the platform through 3″ lazy susan bearings, and both ends of my motor shafts are supported by bearing blocks. I’m turning the wheels using cheapo HS-322HDs, they work for now and were even able to turn the wheels on carpet. I may have to move to something with more torque in the future though, or maybe get rid of the servos entirely (but that’s a whole other subject). But for now software is main area that needs to progress. 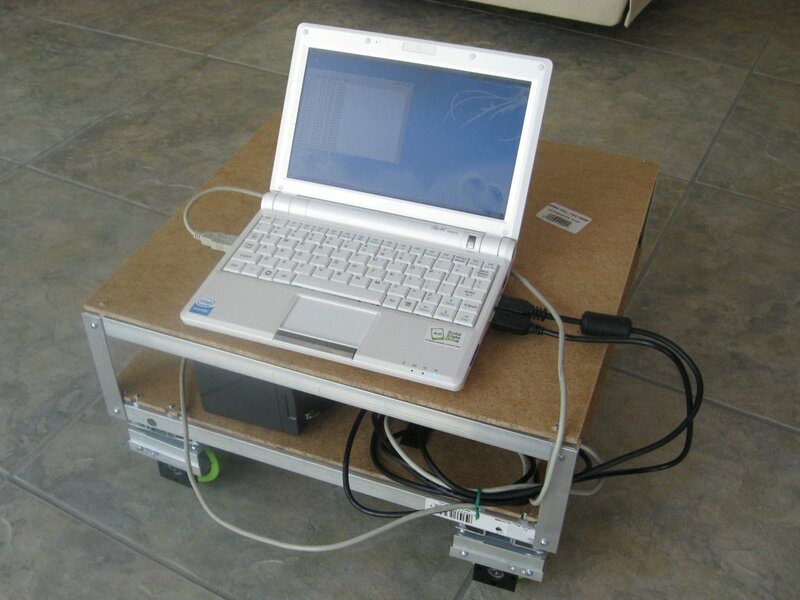 Using VNC to remote login into the netbook was a quick but limited solution. Hawi’s software needs to have its own client-server code. And of course Hawi needs to become more autonomous, by receiving high-level tasks and figuring out how to accomplish them, instead of the forward/backward commands it handles now. As promised, here are some more details on how I implemented back-emf to control the wheel’s rotational speed. First, what is back-emf exactly? When you apply voltage to a DC motor, it turns. But also when the DC motor is turning, voltage appears on its pins, like a dynamo. This voltage is the back-emf I’m using here. The back-emf voltage is proportional to the speed at which the motor turns, so it can be used to measure the motor speed. But this can only be measured when the pins are not already supplied with voltage from the h-bridge. So we need to “cut power” for short time intervals to do the measurement. For more details you can visit this site. The controller I used is an Arduino Duemilanove and an L298 based H-bridge from solarbotics. You’ll notice the h-bridge has one enable pin (E1/E2) for each input pin (I1/I2). I need separate enable pins when I measure the back-emf, because one output has to be set to ground, while the other is on hi-Z. On most h-bridges I1 and I2 share the same enable pin. So to get around this limitation, I only use of the h-bridge. Then combine two halves to make a full h-bridge with separate E1/E2 pins. Luckily the L298 has 2 full h-bridges on the same chip. So I one L298, with its two h-bridges, controls a single DC motor. Both motor wires are connected to analog input 0 through identical resistors. But since one of those 2 wires will always be set to the ground (exactly which one depends on motor direction), the other wire will receive the back-emf voltage from the motor. So effectively the three resistors are a voltage divider by 3. Since the theoretical maximum back-emf voltage is 12V, the analog would see a maximum of 4V, which is fine for its 5V range. When the motor is running, the arduino will run the motor for 100ms, by setting one output to the ground and the other to a PWM signal. When the 100ms are up, the PWM output will switch to hi-Z for 4ms: first 2ms to allow transient currents to flow out, then another 2ms to measure. The average voltage taken during those last 2ms is then compared to our target voltage. Then PWM signal driving the motor speed is increased or decreased depending on the difference between that average and the target voltage. There is room for improvement in the algorithm. shortening the 4ms during which the motor is not driven, but back-emf voltage is instead measured would allow us to measure more frequently, and react more quickly to changing conditions. While these 3 points are valid, I’ll wait for the motors to be mounted on an actual platform to make tweaks that are really necessary. Here is the video showing back-emf in action. After working on my robot arm, it became obvious I needed to attach it to a mobile platform that would be able to move around and do things. So I decided to build my own platform. Why not take an existing platform? Well for one, it takes half the fun away! But also it allows me to build something tailored specifically to my needs, or that can be upgraded should those needs change. As a first step, it seems logical to start with the wheels. To keep things as upgradable as possible, I built separate modules for the motor and the wheel. This allows me to upgrade one module while affecting the others as little as possible. I’ll post more details on back EMF next time.